This jewel of a Brunello di Montalcino estate was first planted in 1978 by Federigo Abbarchi and Angela Corioni on marne and iron-rich red silt soils at 450 msl on the north-western corner of Montalcino; bottling beginning in 1982 under the eye of Giulio Gambelli. 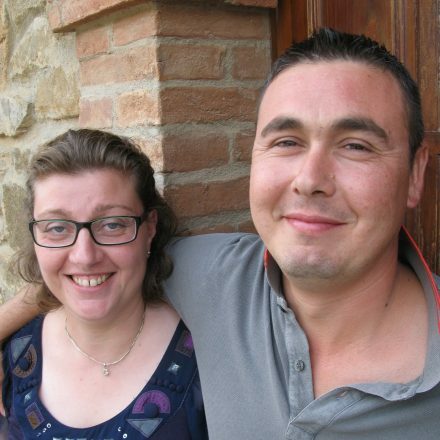 Meanwhile Loredana Tanganelli, the daughter of Montalcino’s postino (postman) & current custodian of the Scopetone estate, was either just being born or was soon to embark on a career in carpentry & apiary, before planting some vines in Montecucco, near Porrona, during the early 2000s. In 2003 Loredana the apiarist met Antonio Brandi the zafferano farmer from nearby San Quirico, & they planted some more vines together. Daughter Giada was born on 15 January 2005. Skip to 2009 when Loredana & Antonio started to rent the 1.5ha gem of a Scopetone estate from Angela Corioni, adding 1.5ha of their own land. Now they farm 5ha, with the Montalcino vineyards at between 450 – 480 metres asl. Located high up but below the town’s walls on predominantly cool red Chestnut tree soils along with some galestro, their tiny patch of heaven gazes west, so retaining freshness & poise. Their perfumed, relatively delicate wines are sensitively and traditionally made using stainless-steel and 33hl Pauscha Austrian oak botte. > Essentially organic but will resort to chemicals if absolutely necessary. 2015 Rosso di Toscana Sangiovese IGT – c. 12k bts bottled, of which 8k available, 80% fruit from their La Porrona vyd in Montecucco & 20% Montalcino fruit, s/s fermented for 30 days. The vintage is clearly imprinted here: delicious, true, raspberry/sunny red fruit, a beguiling warmth of Montecucco fruit, yet held in line by the nobler Montalcino element. … retasted Nov’18 from bottle: fine, tonic, tea leaf balsamy, flesh, juicy, minerale, energetic, uplifting, demanding for a Rosso di Montalcino, such is the vintage! 2015 Rosso di Montalcino – c.1800 bts available bottled in Jan 2017, from 6 & 38 yo vines, no oak; ; blush red, rich fruit, kirsch rose/raspberry, indeed rose cream, suave, fresh strawberry. Noticeably more focussed, more vertical, more skeletral/galestro & hence more complex than the softer Sangiovese, clearly showing its Montalcino pedigree. Very neat, but joyful too! 2015 Brunello – tasted from botte Nov’18, prior to bottling in March 2019; Loredana & Antonio’s cool, elevated spot 420m asl up below the city walls seems to have suited the 2015 vintage: presence, tea leaf & quinine, focused but also joyful, so alive, pert, glacier red cherry stone, gleaming, one to wait for! 2014 Brunello – 13.5%abv, from barrel, 50% less fruit harvested 5 times! Fresh, complete, tight, porcelain texture, good richness here despite the difficult conditions. They’ve evidently worked very hard & been rewarded for their endeavours! A great surprise. Retasted Jan’18 from two 10Hl botti Pauscha, pre bottling in Aprile ’18: ethereal, delicate, pretty Pinot, tea-leaf & orange peel, lots of tiny red fruit, tightly packed, buonissimo…reaping the benefits from their hard work, 5 harvests to select the best fruit & Angela’s/Scopetone’s 40 year old vines! …retasted Nov’18, having been bottled in April, only 2,200 bottled in the end! Recalls the long, Sept 25 – Oct 4th with 5 separate selections. Fragile, Pinot-esque, ethereal, shy…needs time in bottle! 2013 Brunello – 14%, tank sample, bottled 20 July 2017; focus, tobacco, tight red cassis, bright, integral, poised, wonderful sweet, red spot, promises something special…sealed with a high grade NDTech cork from Amorim!